As Grace attended high school, she dreamt of becoming an Olympic class figure skater. Everyday, Grace trained diligently to move on the ice like her namesake, with her coach and lover guiding her every step of the way. But after discovering her coach had had an affair with her rival, Grace's heart became as cold as the ice she skates upon. Yet deep beneath that cool exterior, the fire of rage and jealousy threatens to consume her. Grace enters the tournament to release the fury that is a women scorned. As the first ever fighting game character to fight on skates (roller blades to be exact), Grace was a pretty catchy and original character design at the time of her debut. While her attire is somewhat plain... she definitely suits the "armored costume" theme of Fighting Vipers with her ridiculous amount of skating gear. On that note, if you really need that much skating gear... maybe skating isn't your thing (unless you're doing a roller derby - which I guess is what she's going for). 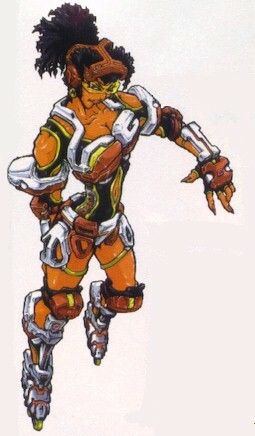 While many of the "lesser known" fighting game characters of the 90's were blatant wannabes - trying to look exactly like existing popular characters, Grace (like others from Fighting Vipers) was a refreshingly unique, new type of fighting game character. From what I remember, her fighting style wasn't particularly memorable or remarkable... but she has some cool kicks, and that move where she flips and lands on her opponent. I could see her being a really cool rebooted character with an updated moveset in a future title... maybe someday.